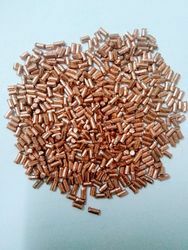 Manufacturer of a wide range of products which include copper cut wire shot, copper anodes and copper shot. Copper Cut Wire Shot , they show good mechanical and corrosion resistant properties, excellent thermal and electric conductivity. Small amount of alloying elements as Cr, Zn, Ag, Cd, Mg, Sn Allow to improve the mechanical properties. Applications Copper balls are used in Galvanic Applications and in the field of Electric Industry. Chemical Composition Cu 99.900% Min. Vinayaka shot pvt ltd is manufacturer of Copper Anodes and Copper Anodes are precision manufactured using pure Copper cathode that makes these highly useful in application areas like for making decorative items, used in Rotogravure machines for printed circuitry, used as electrical ground rod, in electro-forming applications and in many other functional uses. 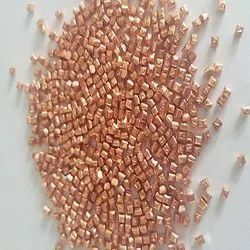 Copper Shot Nearly Pure copper balls , they show good mechanical and corrosion resistant properties, excellent thermal and electric conductivity. Small amount of alloying elements as Cr, Zn, Ag, Cd, Mg, Sn Allow to improve the mechanical properties. Applications Copper balls are used in Galvanic Applications and in the field of Electric Industry. Chemical Composition Cu 99.900% Min.